Sealaska Heritage Institute (SHI) is sponsoring a Tlingit flautist to play during an event featuring the Juneau Symphony, which will perform in SHI’s clan house this month in a joint fundraiser to support orchestral programs and Alaska Native cultural arts. George Montero, who is from the Shangukeidí clan in Klukwan, is a flautist and maker of Native American flutes. 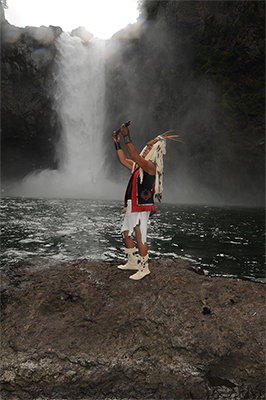 Montero has performed in many venues across the country, including the Smithsonian’s National Museum of the American Indian in Washington, D.C., events for the National Congress of American Indians and the Seattle Public Library Living Culture Exhibit. He grew up in Juneau and now lives in Lynnwood, Washington. Montero will perform during the Juneau Symphony in Shuká Hít Series—Flutes From Around the World, which will mark the first time SHI’s cedar clan house has featured orchestral and Tlingit flute music. Montero will perform separately from the symphony. He will later give a public performance which will be open to the community free of charge. Shuká Hít Series—Flutes From Around the World is scheduled from 6-9 pm, Saturday, Jan. 19, with a reception at 6 pm, followed by the performance at 7 pm, and dessert and coffee following the performance. Tickets may be purchased through the Juneau Symphony at 907. 586.4676, info@juneausymphony.org, or the symphony’s office at 522 West 10th Street between 7-11 am, Monday through Friday. Montero will give the free performance from noon-1 pm, Tuesday, Jan. 22 in the clan house. Everyone is welcome. Caption: George Montero with flute. Photo courtesy of George Montero.